Sabudana khichdi is a very popular dish in Maharashtra. Sabudhana khichdi can be prepared using two types of sabudana be it large or small. Sabudhana also known as Tapioca is a good source of protein, which helps in building, healing and strengthening of the muscles. It is also rich in iron and calcium, which helps to maintain bone health. 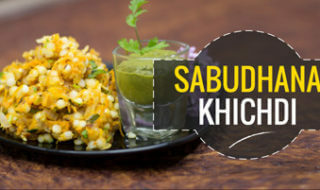 This sabudhana khichdi recipe is tasty and filling and will keep your taste buds tingling for more! Take oil in a pan and heat it. Add cumin seeds, curry leaves and ginger to the oil and saute it. Add powdered ground nut, onion and carrot to it. Saute them as shown. Then to it add boiled sweet potato, chilli powder and some salt. And finally add soaked sabudhana to it and cook for 10 mins. Put some curry leaves above it for seasoning. You can now enjoy your delicious sabudhana khichdi.